The project of developing Azerbaijani gas condensate field Shah Deniz in the Caspian Sea is one of BP's most significant projects in Eurasia, British Petroleum director for international affairs Greg Saunders said at an international conference organized by the Jamestown Foundation in Washington on Tuesday, Trend news agency reported. Saunders called the project of the South Caucasus Pipeline, a section of the Baku-Tbilisi-Erzurum (BTE) pipeline crossing Azerbaijan and Georgia, as the most advanced engineering project of modernity. "For the first time in the history, this project will open a south way to deliver Caspian gas to Europe," he said. He also added that Shah Deniz development project will help strengthen energy security and strategic interests of the EU and the U.S. in terms of multiple projected increase in consumer demand for natural gas. The contract to develop Shah Deniz was signed on June 4, 1996. Participating interests are: BP (operator) - 25.5 percent, Statoil - 25.5 percent, NICO - 10 percent, Total - 10 percent, Lukoil - 10 percent, TPAO - 9 percent, SOCAR - 10 percent. The gas produced from the Shah Deniz field is transported via the BTE pipeline. The gas is supplied to Georgia and Turkey. Azerbaijan also is the buyer of gas. 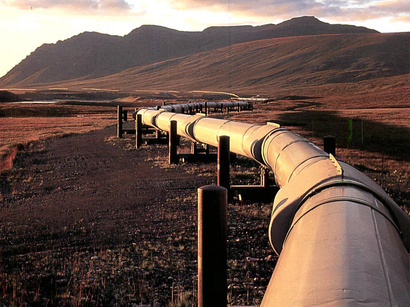 At present, the partners of Shah Deniz are considering two possible transportation projects for the shipment of Azerbaijani gas to Europe - Nabucco West and Trans Adriatic Pipeline (TAP). These projects are considered with the same criteria used to make a decision on a route by May of 2013.